Bats, the only truly flying mammals, inhabit Asia, Africa, Australia, the Americas and all of Europe. With 900 to 1,250 variants, they represent 20 percent of all mammal species and constitute the second largest and most diverse group of mammals behind rodents. Bats live more than three times longer than other mammals their size -- some as long as 30 years. Their relatively long lives may be related to their sleeping habits. Bats expend less energy while in hibernation and daily states of torpor or semi-hibernation. Bats famously sleep hanging upside down. This adaptation allows them to huddle closely together for protection against cold and predators, and it enables individuals to expend less energy when taking flight. Specially evolved feet lock onto an overhead surface and keep the bat in place without requiring any effort; when the bat awakes and takes to the wing, it simply drops into the air. Bats sleep in caves or anywhere dark and cool. Some bats share a sleeping location, or roost, with thousands or even millions of others. Most bat species have three types of roosts. In temperate climates, summer’s warm weather signals the start of the mating season. Pregnant female bats sleep together in maternity roosts to give birth and care for their young. After 6- to 9-week pregnancies, mother bats nurse their babies. Young bats can fly on their own at 4 weeks to 6 weeks of age. Males and nonpregnant females have day roosts, which are the most varied roosts. Day roosts include trees, caves, rock crevices, and the chimneys and attics of man-made structures. Winter hibernation roosts are more permanent and protected shelters, usually underground caves. Bats are relatively small mammals with high metabolic rates. 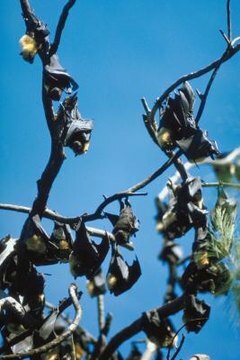 They hibernate because maintaining a constant livable body temperature in cold weather would require them to burn effectively more energy than they can generate, since the insects that bats consume are not readily available in the winter. Hibernating during winter slows metabolism, heart rate and breathing. Bat hibernation is not strictly seasonal; they hibernate for short periods of time year-round whenever the temperature is low or food is scarce. As of 2012, between 5.7 and 6.7 million bats in the U.S. and Canada had been killed by white-nose syndrome, according to the U.S. Fish & Wildlife Service. Fatality estimates remain difficult because populations of common bat species were not consistently monitored before the syndrome's outbreak. The disease is named for the white ring of fungus that appears around the noses of dead bats. Although scientists don’t know precisely how the infection works, it appears to somehow accelerate the depletion of a hibernating bat’s fat reserves. This causes the bat to wake too early and go out seeking food in the dead of winter. Scientists estimate 90 percent of bats infected with white-nose syndrome die of starvation.